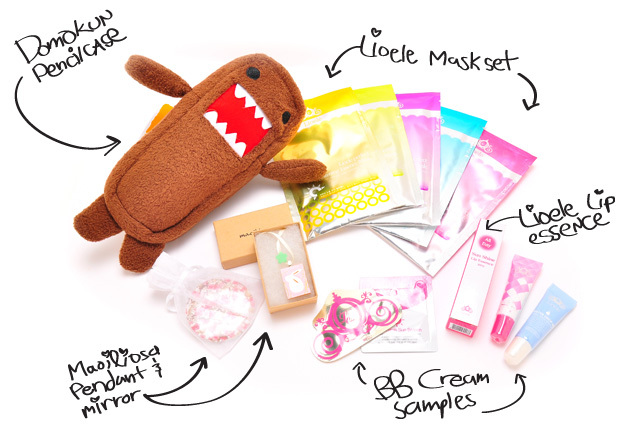 ekiBlog.com: Sponsored giveaway: WIN a Domo-kum prize pack! Sponsored giveaway: WIN a Domo-kum prize pack! I shared with you this wonderful store Soyfashion.com last week, now they have kindly sponsored a wonderful and kawaii prize pack for a 1 lucky reader to win! well please follow the direction and you should have no problems! thanks eki and soyfashion for having this giveaway. everything looks soo nice. omg i can't pass on this one.. domo-kun!!!! My internet stopped working when I tried clicking 'submit' so I may have entered more than once by accident, sorry about that! Thank you so much for this giveaway Eki! :D I joined and I hope to win hihi but if not you're really an inspiration to me! ahhh, domo kun pencil case is too cute. he will definitely be put into good use for my many highlighters. and wow, so many nice samples to try. good luck to all thanks eki and soyfashion. eki! how are you? you always host wonderful giveaways! they are so cute this time with domo! I already entered, but I just wanted to say thank you for the giveaway! entered this giveaway a few days ago. to all of us who participated, ganbatte ne!.. arigatou eki-chan..